S and I had left the previous house with extra cans of paint, which we used in the Hobbit Hole, but haven't used up – so we're continuing these older colors through some of the smaller rooms. The big rooms need multiple gallons, and so we went paint shopping, brought home items called “knightly straw” and “mango bean” and got to work. Luckily, S had snagged speakers such that we could listen to the vast collection of 80s rock while we taped and slopped. S: I think it's Thomas Dolbey. R: That would explain much. R: Radio KAOS, I believe. R: This sounds like a carnival. It's from Grand Illusion, isn't it? S: Well, it's Styx. Must be mine, I don't think you like Styx. R: Sweetie, I had a complete Styx collection when I met you. Damn. I'm old. R: “In touch with the ground/ I'm on the hunt I'm after you / Smell like I sound I'm lost in a crowd…” I'm having flashbacks the a recent Dr Who Episode. S: The one on the sub, I know. R: Forward to the next song, would you? This is music to be jittery to, and I don't want to spill. R: I wonder if the neighbors now think that 10 hours of hair bands is going to be normal for the weekends. Just what every new homeowner likes to see upon getting the keys: the neighbors tree blew down, taking out a small chunk of our fence and lightly brushing the garage roof. Sigh. But we have the keys, and S spent a good day on the telephone making sure we had utilities and Internet, and even talked the power company into acknowledging us – apparently the property is on the border between 2 electric companies, and neither thought we belonged to them. Hopefully we will get the interior paint done and other pre-live in stuff done shortly, and we'll be able to shift from the Hobbit Hole apartment to a place with tall ceilings soon. Visit Wilsons Window Cleaning New Malden for house cleaning services! Flying from Portland to Rome takes 14 hours, with a layover. Amanda is a seasoned world traveller, but Scott and I were new at this, and got some advice on medicating through the discomfort and jet lag. First, Billy our ear expert recommended a nasal spray called Afrin which, along with some ear plugs, prevented the post flight ear equalizing action. And we brought some sleeping meds for the long flight. Scott, alas, took the Ambien shortly before discovering that dinner was being served. It takes about 10 minutes for this drug to take affect, and he stayed…conscious, I guess, for about a half hour, so that he could eat his dinner. Mobile might be a better term. He ate the main course, then started working on the dessert but couldn’t open the wrapper. So he grabbed some plastic ware to assist. When we asked him why he was attempting to open his brownie with a fork, he drowsily told us it was armored. At this point, Amanda pulled out a camera and interviewed him. He, of course, remembers none of this. I waited until after eating to take the temazepan I’d brought. It helped me fall asleep, but not stay asleep through the 8 hours of screaming babies on the plane. We negotiated our way through the short layover in the land of blonde people and then tried to doze on the short leg, but I have to say we were pretty wrecked when we arrived. Finding our AirBnB apartment was fun in that condition. It’s a nice little place with a double bed and a daybed, tiny kitchen and a tiled bathroom, with windows overlooking the light well. I recall describing to my companions the structure of a roman apartment building as I’d learned it in the Colleen McCollough books, but we all crashed for an hour nearly immediately. At 4:30pm local time, we were showered and alive and exploring the city. We meandered through the cobbled streets, seeing old men hanging out of shuttered windows, streets cobbled with square rocks on a diamond pattern, street vendors with a carpet full of handbags, and weathered buildings. There are main thoroughfares are full of automobiles, busses, trams, and scooters. A lot of scooters. Most of the residential area roads are tiny twisty alleys between structures built off the walls of their neighbors. Pedestrians walk out in the streets, making way for slow moving cars and scooters on the tiny roads and waiting for a big enough break to cow the vehicles on the bigger streets. One mustn’t flinch when crossing the street. Alas, I did, and got left at the median while Scott waved and Amanda took pictures of me, stranded amongst the autos and motorini. We stopped in our neighborhood’s church – Santa Maria in Travestere – but the services were going on, so we didn’t stay to look for the plaque for Belisarius. The fountain out front was a common gathering place – people sat on the steps because basically there isn’t much in the way of public seating anywhere in Italy. We crossed a river in our wanderings, and realized its the Tiber. Shortly after, we happened upon a block fenced off, with signage in several languages, asking you not to feed the cats that inhabit the excavation below. This was the Torro del Argentina, rumored to be where Ceasar was stabbed. It’s a tram destination (and there’s a feline sanctuary run out of the ruins). History is literally laying out in the open here. There’s so much history, in fact, that it must be hard to run a city. I mean, they were laying some fiber optic or something and had a street torn up, and we could see brickwork from ancient times. Rome was built on Rome. There was a nightly art market in booths beside the fountain of the four rivers in Piazza Navono, which was only a little way from the Pantheon. Which is free entry, so since we are here…. The backside of the building is pretty non descript, but the front has the standard rows of columns and the interior is full of warm, colorful inlaid stone and religious icons. The roof is coffered, and while the walls are 20 feet thick and basalt, the dome is made of lighter and lighter material unit its a concrete with pumice aggregate and then the opening at the top, which was the only light source. The interior of the portico roof had been decorated by bronze sheathing, but some Pope stole it to make some additional artwork in the Vatican – more on that later. Also more on the Pantheon later, when we returned in daylight. But now we’re starving and we pick a ristorante, nearly at random, and have a cheese plate and 3 pastas that we mix and match. Spectacular. On the way back to the apartment, we stopped for gelato in the square in front of Santa Maria, and sit and listen to street musicians and watch passersby while leaning against the fountain, while nearby other diners enjoy the ambiance (and the occasional large candle). For the month of September, there is a hillside in NE Portland that fills with picnickers every evening at sunset. The blankets are laid out with little space in between, and people share treats with strangers. The reason for this gathering is up in the air, where the blue sky is full of Veux swifts. I had gotten their first, and saved a space of til the pub crowd, the hashers, and the Aussies who had organized this outting had arrived from their separate busy days. My bike had held the chunk of grass in reserve, but got tossed into a car before the auto went blocks away to find a parking spot – both picnic land and parking becomes a premium as the evening wears on. We all nibbled on our respective meals – Scott had brought me a salad – and watched the sky, and the school below us. The chimney of the school somehow became the rest stop for a large flock of migratory swifts years ago, maybe decades. It's such an institution that the Audebon association – with fundraising from the students and neighborhood – helped create and alternative heating system and shore up the now defunct chimney for the elementary school. The only purpose for this brick structure is a night time shelter tens of thousands of birds for a month in the fall. It's not that they don't need the retreat. As the crowd watches, a peregrine swoops through the flock. It looks like he did not score a meal, and as he veers off, a couple thousand little swifts harass him. The picnickers applaud – and I'm not sure who they are rooting for, the falcon or the prey. As sunset falls, the flock circles into tighter spirals and begin to descend Into the chimney. It's a bird tornado. We watch them disappear into their roost and packed up for our separate journeys home, to our own roosts. Tomorrow at dawn, the birds will emerge with less fanfare and hunt for insects all over town while children learn history & science next to the chimney, and at night the adults and families will gather again to watch the flock. The fact that this is just a regular Portland outting warms the heart. Sandy Ridge Trail is named after the town of Sandy, Oregon, that sits below and west of the trail…or maybe it's named after the Sandy River, which erodes the volcanic landscape from Mt Hood and flows past the aforementioned town. It is not a giant dune. Well, Scott can say. He's the one who endo'd today. The climb is 1600 feet and paved, and then we strike single track and continue climbing to the edge of the Bull Run watershed (which serves as Portland's municipal water supply) and then to an overlook to the Sandy River watershed – which by the way could be improved by topping a tree or two that are between the ledge and Mt Hood (hint hint, Jason/Shane/Chris). Then it's a lot of berm turns and terrain features all the way back down. An incredibly fun descent that actually takes twice as long as 'that damn road climb' (Scott really isn't fond of hills. Or roads). Even with the crash, we had a great 2.5 hour, 10 mile ride. My honey and I tend to do a lot of activites apart, or in our own heads, but occasionally, we do go out on dates. The dates don’t tend to be things other folks find …romantic. Thursday after work, I got on my bike and pedaled, not to home (20 minute commute) but to where some of our toys are stored (40 minutes of bike time). I must have hit a pot hole because a mile or so from her place as I was getting some interesting shimmies and rubbing. I have wheel truing in my near future. Anyway, I pulled into the drive a few minutes before my honey got there – his food gathering attempt was in vain, our favorite Chinese restaurant was closed. We did some major combobulating of gear (leaving my bike, changing racks, etc), then drove off to gas up the car and stop at subway for a couple of meal deals. Then we headed to the Riverside Boathouse and unshipped the kayaks. It’s a short carry down to the floating docks where the dragonboaters and sculling crews were beginning to come in for the night, and we wiggled into neoprene and slipped our hulls into the water: his yellow, mine red. 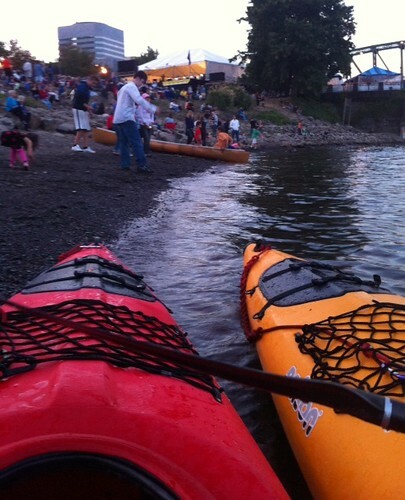 We paddled across the Willamette and noted where the crowds were, and shortly headed upstream, passing several large boats at anchor, their crews relaxing on deck with a drink. Chatting a bit with the captain of the Luscious, a purple & red 54′ rig with a huge main mast, we found he was appreciative of finding kayakers with lights, and thought the headlamps we had on were curious. He takes the boat (ship?) up and down the coast, no further than Vancouver (BC, I assume). As we paddled away, we commented to ourselves that with that rig, we’d be sailing to Alaska or Hawaii. Not far past the downtown area of Portland, we approached the construction of the new train/bike bridge. The west tower is up past the road deck, so (we speculated) the rest will be going up quickly, and then they’ll get going on the east tower. Completing our inspection, we turned and had a short sprint downstream, back the the crowds in waterfront park. Intermission was over, and the conductor of the Oregon Symphony Orchestra introduced some guest performers, and told stories we could not quite hear between performance pieces. The land bound audience was picnicking, sipping wine, chatting, and allowing their kids some time to skip stones in the river while the music played. The many boats moored up held small groups, complete independent of the size of the craft – a couple hung out in a large speedboat, and offered us snacks, a mob of 6 or more in a pair of canoes huddled around an anchor point, etc. we kept station, more or less, floating through the arts lovers, and trying to stay away from the kids on shore. Alas, a trio of young boys got a hold of an aluminum canoe, and paddled out into the anchored boats and proceeded to scream at each other, threatening dunkings at the top of their voices. They’d been playing loudly close to shore, but after ten minutes of this out she we were, I powered over to them and asked them seriously and sharply if anyone was hurt, were they injured, is someone dying? They confusedly said no to all this, and so I pointed out that there was a concert going on and the people around them could not hear it. Then I paddled away. I assumed the applause about then was from something on stage, but my honey says it was the boaters around me. The kids stopped being annoying. We got treated to some Swan Lake, complete with spotlighted ballet, though we were too far under the rise to see more than the impressive high jumps. And then they started in on the 1812 Overature, which was why I had made the arrangements. I loved the story about the piece being a humdrum item that a Boston Pops conductor decided to dress up (and hopefully attract ticket sales) by firing off cannons on stage – pure genius. We never hear the piece without the firepower these days. Sure enough, after the orchestra did a fine job on the descants, the 218th Field Artillery, hanging out on the other side of the Hawthorn Bridge, started up their volleys. I’m not sure if it was the difference between hearing the music directly in front of us and the cannons downstream, but there was a bit of a lag – really didn’t detract from the enjoyment of the combination. Meanwhile, while this was going on, the Luscious began parading across the river with a house-sized US flag hanging from the main mast, lit by spots. They turned near the bridge, shifted the lines and came back the other way, just as the piece was wrapping up in the final echoing booms, and then the fireworks started. I’m not sure how this worked for people on shore, or even in larger boats, but from the water level, the fireworks were exploding around the full blue moon like a halo. Our angle was perfect. For a while, the Artillery on shore competed with the showy stuff coming off the barge, and gun smoke wafted around us. It was 10pm and we still had to pull ourselves across the river, load boats, drive them to their storage area, unload & hang, change racks back, load my bike, and drive home. But it was a spectacular evening. Dinner, a cruise, the symphony, and a light show. What else can you ask for in a weeknight date? Woke to alarm (again? We’re on vacation!) and drove back into the park – the kiosk was unmanned at this hour. We actually had to pay for the stream side site with composting toilet -$21- as we weren’t up before the camp host. We went straight to Curry Village Camp Reservations and took turns packing or being in line waiting for them to open & get us on the waiting list for an inpark site. While this was going on, Scott chatted with a lady who was thinking of moving her rv & husband out of the park, as he was having issues with the altitude. They made a deal & we got on the list and headed up trail to Happy Isles for the day’s hike – Vernal and Nevada falls. We weren’t the first people on the trail, but we were damn early and the hikers were sparce. We were expecting this to be an all day trail, calculating a turnaround time, but then fairly flew up the first 2 miles of it. It was steep, but paved and pretty and in the morning we had lots of energy. At the bridge, there was a restroom and water, and our hike turned a good deal more rustic as we headed up beside the stream. Very shortly, we hit stone stairs. Some 300 + stairs carved into the granite and being often misted in the spray of the waterfall are known to be slippery and dangerous, but someone must have turned down the valve, as it was simply cool. Vernal fall is 370 feet of gorgeousness, and Scott’s progress suddenly slowed to a creep. He stopped a lot to photograph the falls, the mist, the rocks, the rainbows – even me on the steps going to the top. He’ll have a lot of great pics of that fall! The last chunk of the trail to the precipice had a handrail that was required. The slick rock was about a foot or so wide, stuck on the edge of the cliff face, for twenty yards or so. There was no passing of slow hikers here. Then we were at the top, having a snack in the shade of a lone tree and watching people watching the water go over the edge. We continued up beside Emerald Pool, which was a healthy green, though more dark than emerald in my opinion. The upper end was basically an angled granite slab, and the citified looked at it and proclaimed “waterside!” – I can only imagine what that sandpaper slope would do to someone’s swimsuit, and then skin, if they tried to slide down it. We took photos as we poked along, crossed the bridge and continued up, spending more and more time adjusting poles and shoes and whatnot until we got to the bottom viewpoint for Nevada Fall, which is 320 feet. We lunched here, and the white-shouldered ground squirrel that claimed this plateau as his own was determined to see what was in our packs, and not shy about it. While Scott was taking pictures, I was defending the gear with my life. Then I lost sight of my Scott. A German couple had been interacting with him when last I saw him, and after a while I asked them if they’d seen him – jokingly asked if they’d tossed him in the river. They laughed and pointed downstream – “oh,” I said, “you did toss him in the river!” More laughter, and Scott waved when he saw us looking at him. Eventually he came back, and we packed up & headed back down to the pool. From here, we took the John Muir trail, which is supposed to be the milder way down. It started with a climb. Up we went, leapfrogging a pack of 11 girl scouts and 3 chaperones from San Diego (one of whom has in laws in McMinnville, so we talked sci pub, and another who was Not Active Enough for this Hike). At Clark Point, Scott took some infrareds, which took a bit longer than expected, and then we decided – since we had a 3:00 appointment – that we’d basically sprint down, and picked up the speed. Oddly enough, we had the best cell signal that we’d gotten in days, and we kept fielding texts from friends back home. However, we were basically off the trail before 3, but not back at camp reservations in time. Still, Scott’s deal making earlier landed us a site, and we were able to meet our benefactor & pay for the site they were leaving. The new camp was to be on Tioga Road, so we did the last of the valley stuff – making dinner in the crock pot, mailing postcards, eating ice cream, showers at housekeeping camp ($5! ), and driving up to Tunnel View for evening light. Scott set up his camera, but wasn’t impressed with the light that evening. I set up the table, and we dined with the best view, much to the amusement of the other photographers and tourists at the overlook. A long drive down the valley, then up the other side, in order to find our new camp had us leaving long before the sun actually set. The new site, we discovered, was in Crane Flats, which is forested (ie, no cranes would land here) and at a 20% side slope (ie, not flat). Leveling the van was interesting. There’s no water hookup up here, so in the morning we loaded every water bottle from the tap near the restroom. Had a lazy-ish start and cooked breakfast on the bear box while a couple of neighbor teens stood nearby, fascinated by the four yearling doe wandering through our site. I warned the deer away from my pancakes by telling them they would be pretty when sizzling – this amused Scott for some reason. After packing up and shifting the van, we filled in the holes dug to level us & drove off to get high priced gas from the Crane Flats station, and give a couple a van tour since they say they only haul their big RV around for the fridge. Then across the high roads. We stopped and puttered at the Yosemite Creek picnic area, playing on the logs & rocks, but otherwise spent a long time driving across the pretty woods. As we moved east, the occasional granite crag appeared, and at Olmstead point there is a lovely view down to the same features I’d been looking up at for the past several days. We’re a long way from Half Dome, but the park volunteer had a spotting scope trained on its back slope, and we could see the line of hikers, like ants, using the cable to pull themselves up that last 1/4 mile. We identified all the peaks using an iPhone tool that works somewhat, and avoid the throngs of kidlets playing on the granite slab to take some infrared photos, commenting on how it would be nicer if there weren’t a throng. A little further down the parking lot, or at least the next pull out, gave us a view of Tenaya Lake, and Scott clambered up onto the roof of the van to shoot it – just like the old Ansel Adams print he bought. I took pics of it from a near by slab. We passed the lake, where people were swimming, and continued down to the Touelame meadows townsite, such as it is. All the capital expenditure for the park was really focused on the central valley, and this area has a tiny visitor center (we got stamped), a post office/grill (ate burgers), and a “lodge” which appeared to mostly be cabin tents – we were not impressed. There are more domes in this area, and plenty of high Sierra hikes…but it’s now late afternoon, and we’re on a rest day, so we headed back to the lake, set up an encampment of the hammock and sat & read, wrote postcards, and generally hung out. I stayed in the shade, and the wind was rather chill – I ended up attaching the legs to my zip offs, and putting on a long sleeved shirt. Our neighbors on the beach were actually in the sun, and wearing bikinis. We’re wimps. Navigating across northern California would have been easier if we’d remembered the gazetteer, but we were trusting google…and then we found there was a whole lot less Internet out here. We stopped in the town of Ukiah for dinner at their brewpub – their pilsner was a bit light- then continued across the central valley, finding a BLM land pull off that didn’t actually have no camping signs, and settled in. Wednesday morning we sprinted for Yosemite. It was a lumbering sprint, as we stopped at Amanda’s favorite fruit stand for veggies and crack almonds just north of Modesto. We also swung through a grocery store in some nameless town and got supplies and gas. We reached the park around noon, and plopped down below Bridal Veil Falls on the main drag to eat up our leftovers & decide what to do. All the campgrounds were full. We ended up spending some time orienting around The Village and the transit system, and then took the bus out to Camp 4. I’ve read about the climbers base camp in so many stories – Nevada Barr, John Muir, a couple movies, and it’s always a lawless, drunken place, with dirty sloppy inhabitants. I didn’t find it so – it was actually neat and peaceful, with a few children hanging out in the shade. It was much quieter than the ‘family’ campgrounds across the valley! Let’s hear it for folks who do strenuous exercise, have a beer, then sleep silently in their tents. We stopped at the trail sign, with one leg pointing to the famous El Capitan. We went the other way. We hiked towards Upper Yosemite Falls, which was a 3.8 mile stroll with an elevation gain of OMG. Scott has the actual numbers, but I recall we’d gained 1000 feet over the first 2 miles. We managed to do it almost entirely in the shade too, which definately helped my stability – my sun issues are something I hope to avoid this trip. Scott took pictures of the falls, and we turned and headed back down, cursing the trail builders now and again. There were lots of rock stairs – an impressive number – and occassionally they were sloped, narrow, and offset – we ended up nicknaming it scale mail, and our feet slipped off it like arrows off a knight. Did I mention the elevation? We descended a long time, but it seems to be a ratio of 2 hours up:40 minutes down. We took the bus to the van – one of our fellow bus stop waits walked up & said “hello hikers,” in a boisterous voice and handed out snicker minis – must remember this as a way to meet people. Since the campsites were all filled that we knew of, we headed out of the park to park the van in a dispersed camp beside a river. You know there's been some stress around when I'm the one requesting a lazy morning in camp on the first day of vacation. Sunday we had packed up and drove out of Portland, saturday we had been completely booked with Tacit & Zaiah's commitment ceremony and visiting Floridian horde, and the entire week previous I was covering at work for various people. No wonder I slept in until Scott had finished creating coffee, then I made a leisurely omelet breakfast and eventually Scott pushed us to get going. Our southern drive had a stop at Burlesque, which was about as fun as we remembered, and left us desiring a tree house. We bought nothing, but the woodworking roadside attraction left us smiling and still feel its a fine stop in the middle of a long driving day. We're just north of Redwoods National Park, leaving a bandit campsite beside the Smith River. Yesterday we arrived in the area around dinner time and took a hike in Stout Grove. Only a half mile, but it was enough to banish the last of my all day headache while we enjoyed the big trees. Scott took a picture of me doing my squirrel imitation – I think he's got an identical shot from 2005 when we visited Redwoods while on walkabout. We had just gotten across the continent and begun exploring new ecosystems when Scott came down with an itch – insect bites? No, by the time we hit Crescent City, not only was it obviously poison oak, it had gone systemic, and it was good drugs and weeks later before he'd slept through the night. We don't remember too much from that first trip through Redwoods because we're repressing those memories. Firmly. This time, we were heading from north to south, knew what PO looked like, and wore long pants. It was summer, yes, but it was cool Northern California, and the day was successive rain showers. Stout grove was a short, 1/2 hour hike with a little scramble down to a river bank. The visitor center was a stop to chat with the rangers and stamp the passport – its getting particularly full in western states, I'm going to have to craft a new version of it soon. Continuing through the drive, we stopped at Moormon grove – not impressive – and Big Tree, which is. Big Tree is the widest and probably oldest tree in the park, and apparently the park has stopped trying to keep a large wooden sign with its vital stats near by – instead, they have a laminated photo of the old sign. Scott took a pic of it – very meta. And as we recall, is where we tried to have lunch with the van doors swung wide open and were harassed by a Stellars Jay until we retreated (back then, having the van doors wide was a treat, as we were still From the Land of Mosquitos). This time, we also hiked across the street in an unassuming grove near the creek, and Scott attempted to photograph big trees while perched on the trunk of their fallen brethren, in the middle of the creek. Past the visitor center and looking for a turn off, we instead found a handful of cars pulled off and a herd of about 30 roosevelt elk munching in someone's front yard. We stopped and jumped out and were taking pictures when car 1 came around the corner and slowed down to see the spectacle, and then car 2 zoomed around the same corner and started an uncontrolled skid. It looked to me like we were out of the path of collision if they hit, but to be safe, I ran towards the elk. Into a bog. The cars pulled it out without incident – though the young driver of car 2 heaped verbal insult on to everyone legally off the road and watching wildlife, regardless of the speed he'd been recklessly driving at. I extracted myself, Scott checked that the phone I'd pulled from my pocket hadn't gotten more than a splash, and then I went back to the van to change – I was mud to my hips, and my shoes squished. We headed up Bald Mtn Road to the Redwood River Overlook, which did not appear to show off the landscape as well as Scott had hoped. You could still see the clear cutting canopy differences from the logging that was still going on in 1978, though the trees are defiantly moving back in. On the way down, we hiked over an impressive bridge and through the Lady Bird Johnson grove – where Nixon, Johnson, & Reagan (then the gov) dedicated the national park opening. It was an interpretive trail, and while Scott took endless photos of rhododendrons blooming in front of misty redwoods, I read the interpretive flyer aloud – it sounded like marketing drivel, but most entries had a bite or two of actual education in it. At one point, Scott put his camera down in the center of a hollow tree, shooting upward on timer while we hid outside the bark. Another point he set up a times shot of the two of us. Mostly, though, he shot in the mist. Back on the road, we found cell signal and answered emails and checked weather and our intended route, getting most of that data before we turned off the highway at Redway, and then became self contained again. From Redway to Shelter Cove, we'd been told, is 30miles and would take us 1.5 hours to drive, although the locals do it in about 40 minutes. (pull over if someone comes up behind you – really) It started in a small redwood grove, then twisted through a variety of ecosystems – forest, prairie, farmland – as it wound up the ridge line, with no flow, unexpected corners, and exposure. I expect anyone mildly suseptable will get carsick when following this route; it was extremely disconcerting. I don't want to drive it myself, and I was really glad we made it to our destination before sunset. Scott has declared this road the Californian equivalent of El Camino del Muerte. We pulled into Tolkan Campsite, at a peak of a ridge line, in time to perform camp chores and fetch water, and then the sun went down. The two other occupied campsites soon quieted. Scott stood outside, shaving before bed, and called me to join him. After a day of rolling clouds and rain, the moon was up, half full and visible through the trees. “Most guys,” I told him, “give their girls diamonds. You give me the moon. This works for me.”. He chuckled when I kissed him, and finished using his electric razer by braille in the dark night.